Hi all! 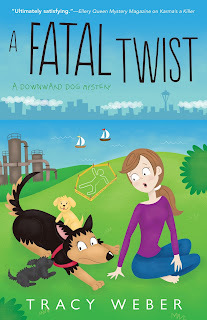 Mutt and Jeff here from Tracy Weber's newest Mystery, A Fatal Twist. Those aren’t our real names but Michael, the silly human who’s decided to foster us, hasn’t come up with anything better yet. We’re six-week-old baby labradoodles (Mutt is a gold female, Jeff is a black male) and we LOVE causing mischief. We were left in a box outside of Michael’s pet supply store, Pete’s Pets. We like that store. It’s filled with yummy treats, soft toys, and this awful-looking jail-cell contraption that Michael calls an “x-pen.” Surely, no one will ever imprison two cute little monsters like us! Michael is planning to take us home until he finds out who abandoned us and why. 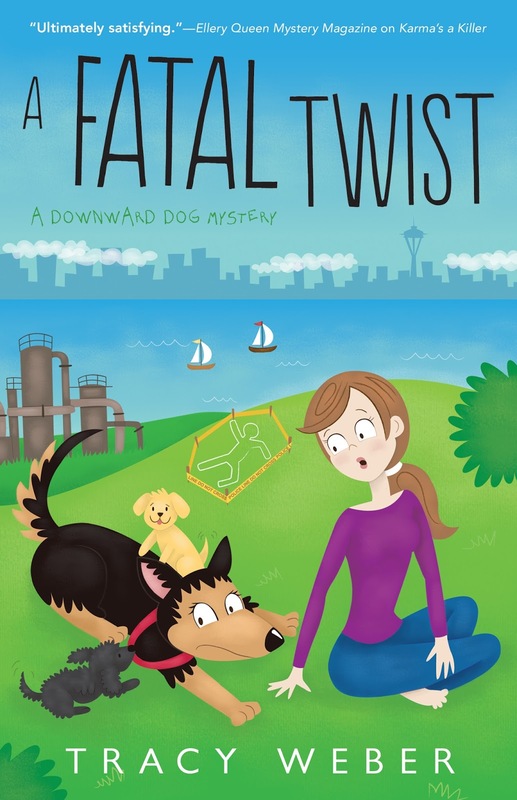 He seems really concerned about this woman named Kate, however, and how she’s going to react when she learns that her canine family has tripled. For some reason, he doesn’t think she’s going to be happy. Because of that, he picked up some yummy smelling Chinese food and a bottle of something called Chardonnay on the way home. We think he’s being silly. Of course Kate won’t mind. We’re hard workers. We like to dig, and chew, and sing, and we have a great comedy routine. Who can resist laughing at a puppy ripping up couch cushions? Michael is also worried about a German shepherd dog named Bella who doesn’t like other dogs. She’ll adore us, don’t you think? Puppies must be some sort of exception. Big dogs love having their ears and tails pulled. And what’s more fun than a puppy swinging from your lower lip? We’re sure she won’t mind sharing her food and toys. There might even be a murder in our adventure, but we’re not yet sure what that word means, so you’ll have to read our story to find out. It comes out in January, but you can pre-order it now! Precious. Looking forward to getting to know these guys and their backstory. They are a couple of tricksters, for sure! Thanks! I hope you enjoy the mystery! Love the cover I would love to read this!! Thanks! I'm really fond of it, too! Thank you, Mutt and Jeff. I love your names and I love this series. Cannot wait to meet you and to read all about your adventures! Do you think we'll help solve the murder?